Private Sessions Are Offered to those students who show a sincere interest in in-depth training and possess an adequate knowledge of T'ai Chi basics. Classes Are Ongoing. You may start at anytime. You are not locked into a set day or time, arrange your class schedule to suit your needs week to week. No appointment is necessary to start. Please call to confirm the classes scheduled (especially around the holidays). Qigong Therapy may involve more than one therapist working in conjunction to produce maximum results. A session lasts approximately one hour depending upon the client's needs. If we feel the session is complete after 58 minutes, we do not continue and risk causing irritation. Conversely, if we feel we need a few more minutes to produce the desired results, we don't stop at exactly sixty minutes. Therapy is by appointment only and can be arranged by calling. Since there is a high demand for our services, the farther in advance you can call, the more likely you are to receive your preferred time. We do not have set in stone hours. We try to be as flexible as possible to meet your needs. Mondays and Wednesdays from 9 a.m. until 4:30 p.m.
Tuesdays and Thursdays from 9 a.m. until 7:30 p.m. Occasionally Friday and Saturday appointments may be scheduled. possible Therapy and Tai Chi Instruction! Ongoing Tai Chi classes consist of Yang style, empty hand, and basic Tai Chi push hands exercises. There are no beginner classes. Classes are multilevel. All ages are in the same class; however we do not recommend tai chi for children under the age of twelve unless you have special concerns and are interested in private lessons. Everyone starts at square one and learns at their own rate with lots of individual instruction. Working with a multilevel group will help you to advance at an accelerated pace. Classes for those under twelve may be offered during the summer. Please call or send an email if you have interest in youth classes. Classes for those under twelve are established based on current interest. You may start at anytime and advance for as long as you desire. There is no need to make an appointment to start, but please arrive a few minutes early for you first class. You may chose to observe OR participate in any ONE ONGOING class. Fees are due the first week of the month. *for those attending ongoing Tai Chi classes; $20/month if not attending Tai Chi classes; $5.00 per class drop-in fee. Saturdays & Sundays 9:15 - 9:45 a.m.
Sundays 11:45 a.m. - 12:15 p.m. Medicinal Qigong - a vital aspect of Tai Chi often misunderstood and neglected; to clean internal organs, skeletal and musculature of toxins in order to promote better health, healing, and prevention of many diseases. Mondays & Wednesdays 6:15 - 6:45 p.m.
Mondays 8:45 - 9:15 p.m.
Tai Chi Sword Form - further enhance energy, balance, flexibility, and body control. Wednesdays 8:45 - 9:15 p.m. This Class is offered periodically as a Special Focus Class for students who have completed at least part one of our long empty hand form. If you are not a regular student, you must have an adequate knowledge of Tai Chi basics and receive instructor permission to attend. 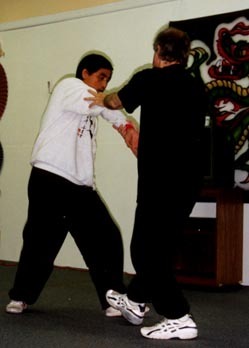 This is to ensure a safe environment in which to learn Tai Chi self defense. Class schedule is based on current interest. Call for an updated schedule. Don't miss out on the great info we received on our 2000 trip to China. We were granted the unique privilege of studying with Master Duan Zhi Liang, a master of over 95 years, whose father guarded the last emperor, and whose grandfather served as primary physician to the last emperor.